The PLA vessel STONENESS on the buoys off Gravesend. 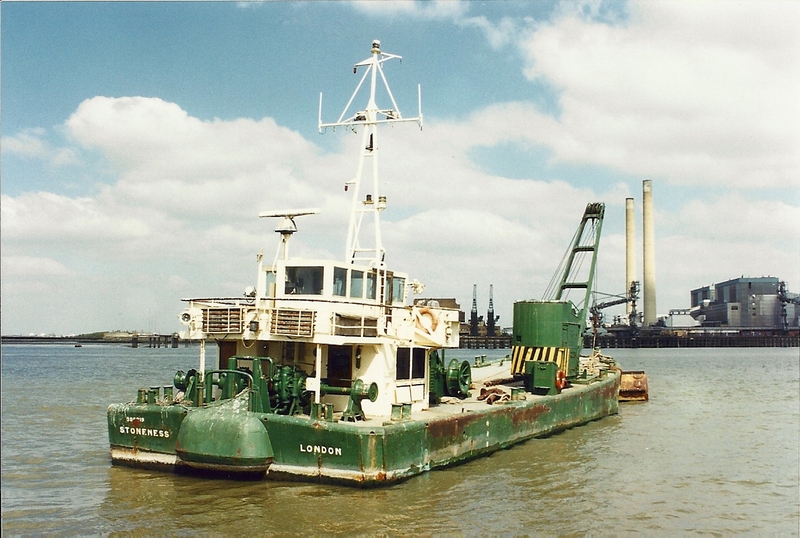 The Port of London Authority salvage vessel STONENESS (235 tons gross) was built at Faversham in 1965. A familiar sight on the river, together with its sistership BROADNESS, it lasted with the PLA until 2000, was decommissioned and renamed NESS. In January 2002 it went to a salvage firm and was renamed MCL I. Three years later, in May 2005, it was bought by a firm at Padstow, Cornwall, its hull was repainted reddish-pink and it was given back its original name, STONENESS. During the early days with its new owner, the salvage winch was removed and some changes were made to the bow area. In the latest chapter in its life story, and it is still an open book, the vessel went to Gareloch Support Services in October 2007. The vessel was rebuilt so that all that remained of the original is the basic hull. It has been given a taller, modern style bridge, a large capacity deck crane, and its bow has been remodelled to comply with regulations. It is now busy at work under the name MEGAN M. As for its sistership, BROADNESS, the last I heard it was at a scrapyard in Woolwich in 2007, under the name MCL II.